It may look as though we’re in the midst of a Shakespearean tragedy. Actually, we’re discussing diets. After a wet couple of weeks we finally have enough sun to bring asparagus up in our area. 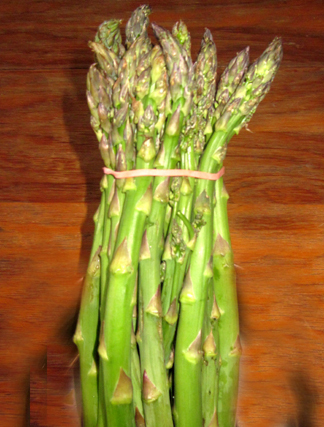 I eat grocery-store asparagus in the winter from time to time. But I CAN’T STOP EATING farm-stand asparagus in the spring. 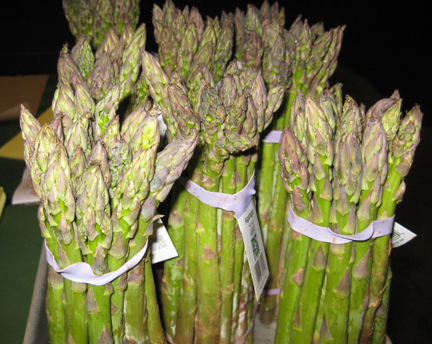 To me the flavor of asparagus embodies this green, lush, delicious season. 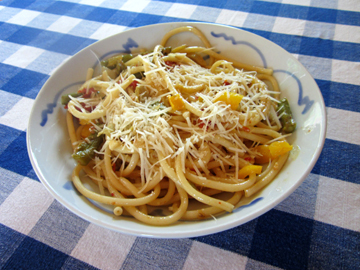 I tend to eat asparagus plain, but as the many asparagus recipes in these pages attest I do also put it into other dishes. 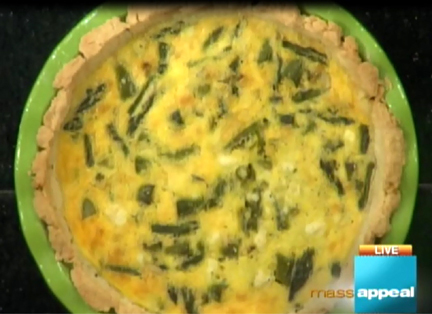 Yesterday on Mass Appeal Seth Stutman and I put it into a quiche I have served several times already this spring—first with sautéed dandelion greens, then with sautéed spinach, and now with asparagus. Seth and I also made rhubarb bread. That recipe was adapted from Land O Lakes. If you want to try my version, add 1 tablespoon orange zest to the batter and double the streusel. And if you’d like to use three little pans as I did, bake the bread for less time than the recipe suggests. The mini-breads took 45 minutes in my oven, but when in doubt use that toothpick! You’ll note from the rhubarb video below that I forgot to add the baking powder, baking soda, and salt. 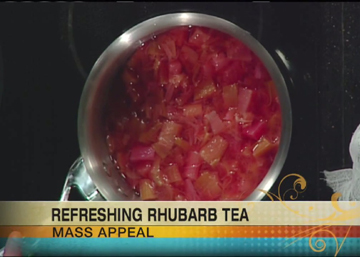 I also FORGOT TO ADD THE CHOPPED RHUBARB! I’m sure all TV stars have days like yesterday. At any rate, I hope they do. I stirred the missing ingredients into the batter in the pans before baking the bread and threw a little more brown sugar on top for color. The end result was delicious; the recipe is very forgiving. Sauté the onion pieces in a little oil until they caramelize (ideally, half an hour or more, but you can get away with 15 minutes if you have to). Sprinkle on a little salt, and remove them from the sauté pan. Preheat the oven to 375 degrees. Splash a little more oil into the pan, and sauté the garlic briefly (3 to 4 minutes) to soften it. Toss in the asparagus pieces, and sauté them just until they are warm. 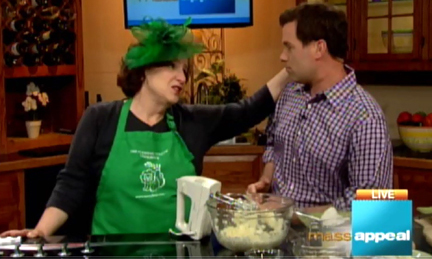 In a bowl whisk together the eggs, the cream, and a pinch of salt. Sprinkle two thirds of the cheese over the pie crust. Top the cheese with the onion, asparagus, and garlic pieces; then pour on the cream/egg custard, and top with the remaining cheese. Place the quiche on a rimmed cookie sheet to prevent spillage, and bake it for about 40 minutes, until the custard is set and the top is golden. Serves 4 to 6, depending on appetite. My friend Grad in Savannah sent me this recipe months ago, but somehow or other it took me a while to make it. She says she always has the ingredients in her pantry. Unfortunately, they weren’t all in mine. The pasta was particularly hard to find. I tried numerous local grocery stores and finally gave up and ordered bucatini from Amazon.com. Bucatini are long, thick strands of pasta that are slightly hollow inside—sort of like lengths of thick pipe. They hold their shape beautifully in the sauce. The word “buco” means hole in Italian; hence the name. Bucatini will be a staple of my pantry from now on. This is one of those things my eldest son loved so much when I made it years ago, he now makes it himself, adding what he has on hand. Rather than a recipe, I think of it more a road map that allows side trips. Leftover shrimp? In it goes. Clam juice? Why not? A little bit of chicken broth left over from yesterday? Absolutely. How about that leftover asparagus? Or those little cherry tomatoes you want to use? You get my drift. As far as I’m concerned, as long as you have the anchovies, artichokes, sun dried tomatoes, pepper flakes, olive oil and perciatelli (or bucatini) you can’t go wrong. 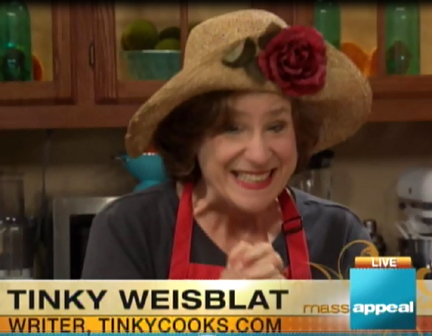 I hope you make this dish. It is even better the next day and I love it cold! Keep the basic ingredients in your pantry (along with a nice bottle of red wine) and you are ready for any foodie emergency—or for when you need a hug. My minor additions (bell pepper and fresh asparagus) are noted below. 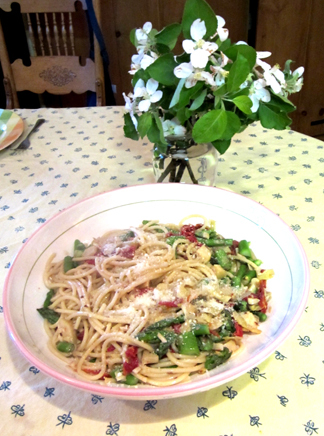 With asparagus season over, I think I’ll try the pasta next time with a little sautéed zucchini and some tiny tomatoes. And broccoli would be divine in the fall. After all, we need hugs in many seasons…. Put the pasta on to boil in boiling, salted water. Meanwhile, place the olive oil in a large skillet. Saute the onion gently until soft. Add the garlic and bell pepper; cook gently until they soften as well. Try not to brown the garlic. Add a little of the artichoke marinade to the mixture. Taste and correct seasonings. Add 1 cup of the pasta cooking water, and bring the mixture to a boil to reduce it slightly. (At this point, Grad sometimes adds 1/2 cup of bottled clam juice or chicken broth. They are not essential, however.) When the pasta is al dente, take it out of the water with a pasta fork and add it to the skillet to finish cooking. Toss everything together with tongs. If it is needed, add a little pasta water one ladle at a time, tossing between additions, until the mixture is a nice saucy consistency. Take the pasta mixture off the heat, and sprinkle cheese on top. If you look closely at the pasta at the front of this picture, you’ll see the little hole inside. My mother loved to tell a story about her introduction to olives. Her mother brought a jar of the things home from the grocery store. Little Janice asked what they were. Janice tried one. She wasn’t sure. So she tried another. She still wasn’t sure. She kept trying. After a few minutes she still wasn’t officially sure that she liked olives. But she had eaten the whole jar. That’s more or less the way I felt about this hummus. As I’ve mentioned before in these pages, I LOVE asparagus. If it were in season year round, I believe I would eat it every day. Now that it is in season I work on new ways to try it every day. I tasted the resulting concoction. I wasn’t sure what I thought. It was a lovely green. (It would have been even prettier if I had saved some pieces of asparagus to decorate the top!) It didn’t taste quite as asparagus-y as I had expected, however. So I sampled it again. Like my mother before me, I was soon very full and out of my test food. In the end I decided I’d publish the recipe. 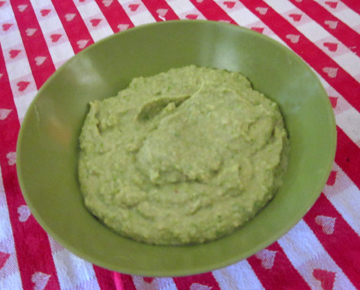 If you want more asparagus flavor, add more asparagus, or cut back on the tahini and water. If you’re like me, you’ll probably eat the whole thing as it is…. Boil the asparagus pieces until just barely soft. Drain and rinse with cool water and/or ice. Set aside. In a food processor puree the chickpeas and tahini briefly; then add the asparagus, water, and lemon juice and puree again. Add the oil and salt and puree briefly. Taste to adjust seasonings; then refrigerate the mixture for at least an hour. Stir in a dab of additional oil just before serving. Serve with pita chips. Makes about 2 cups.